Sugar Cookies – See more cookie shapes on Susan’s facebook photo album for cookies! The best sugar cookies you will ever eat–wait I don’t mean to brag. That’s a lie–yes I do. Made with real butter and citrus zest for a delicious flavor that you won’t be able to resist. Available in seasonal or holiday shapes that are perfect for every occasion! These cookies are one of my personal favorites–I can’t stop eating them. With nuts or without. A dunker’s delight, S cookies offer a rich, buttery flavor and a satisfying crunch. Available vanilla, chocolate chip, or chocolate. Made with real Colorado honey these delicate, lacy cookies combine the sweetness of honey with the nuttiness of sesame seeds. 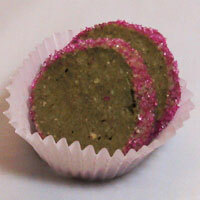 Flavored with matcha (Japanese green tea powder) and ground almonds. Goes great with tea or coffee. Get your green tea in cookie form! This cookie features an unsweetened pastry dough that gets its punch from a jewel-like center of apricot, strawberry, or raspberry fruit preserve. The chocolate compliment to our lemon flavored sugar cookies made with dark chocolate. 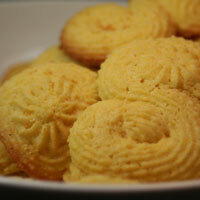 This famous treat, with its shell shape and cake-like consistency make it ideal for soaking up a little tea or coffee. Flavored with all-natural rose water.